In the upcoming 2019 professional baseball season, the Boston Red Sox’s Fenway Park won’t be the only Major League Baseball venue sporting a Green Monster. The Minnesota Twins announced in January plans to construct a massive “living wall” directly opposite home plate at Minneapolis’ Target Field. Facilities staff expect construction on the living wall to wrap up in time for the team’s season opener against the Cleveland Indians on March 28. The living wall will be an eye-catching lattice of hanging plants meant to increase air quality at the ballpark. The wall will “enhance the aesthetics of the center field hitter’s backdrop, without compromising playability,” the Twins said in a statement. The Minnesota Twins announced that Target Field will welcome a new “living wall” in March. The wall, composed of 5700 individually installed juniper plants that cover about 212 m2 (2280 ft2) of wall space, will self-irrigate by drawing from the venue’s rainwater recycling system. This rendering shows the wall’s intended placement in front of the batter, directly behind the pitcher’s mound. Minnesota Twins. The wall will feature 5700 individually installed juniper plants that cover about 212 m2 (2280 ft2) of space. Target Field staff will re-plant the wall each March at the beginning of baseball season. The junipers will be removed each October to be stored at a local nursery for care over the winter. While the wall stands, it will fully self-irrigate with the help of Target Field’s state-of-the-art rainwater recycling system, the team said. The system, locally designed by Pentair Inc. (Minneapolis), repurposes stormwater that falls over a 3-ha (7-ac) area covering the field and lower grandstands. According to a Minnesota Department of Health article about the stormwater system, collected rainwater percolates through a drainage scheme beneath the field, heads toward the outfield, and pools within a wet well just beyond the ballpark’s fence near left-center field. The runoff undergoes three levels of pretreatment along the way — filtration, ultraviolet disinfection, and chlorination. Once at the wet well, an ultrafiltration system processes approximately 473 L/min (125 gal/min) into a holding tank, where a final ultraviolet disinfection system clears out remaining pollutants. From there, a network of pumps and pipes re-circulates the clean stormwater to irrigate the field, wash out stands and bleachers, and, now, nurture the living wall. Target Field received a LEED® Silver certification from the U.S. Green Building Council when it opened in 2010. In 2017, the venue received the first-ever LEED® Gold certification for a professional sports facility, cementing the stadium’s reputation as the “Greenest Ballpark in America.” Besides the new living wall, Target Field also features several water-saving features as well as measures to reduce urban heat-island effects. Wikimedia Commons. Since Target Field opened in 2010, park managers have attempted to make greenery its central focus. The original wall that batters faced featured several native trees, but critics argued that their movement and color made it more difficult for the batter to see approaching balls, leading to their removal the following year. At its projected size, the Twins’ replacement for the trees would be among the world’s largest living walls, said Twins President & CEO Dave St. Peter. 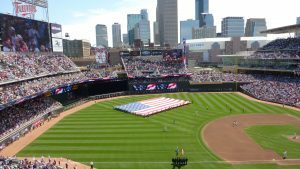 Target Field became the first professional sports facility in the U.S. to earn a LEED® Gold certification for operations from USGBC in 2017. In addition to its rainwater recycling system, the park boasts an assortment of other sustainability features that minimize the park’s environmental footprint while enhancing the guest experience. The baseball diamond, built upon the site of a former industrial facility, features water-efficient landscaping. A host of solar-reflective materials built into Target Field’s roofs and surrounding plazas reduce urban heat-island effects and slash energy usage. Water-saving fixtures, such as low-flow and dual-flush toilets and aerated faucets, use 30% less potable water than conventional features, saving park managers more than 15.9 million L (4.2 million gal) of water per year. With recycling stations scattered across the venue, the park offers solely biodegradable eating utensils, plates, cups, and bowls, and donates excess food to local charity organizations. According to the Natural Resources Defense Council (New York), only 16% of Americans follow the latest advancements in science, whereas about 70% follow sports. With their new living wall, the Twins are elevating the profile of green infrastructure benefits and possibilities in a way that directly engages the general public, many of whom may be unfamiliar with the concept. As a Red Sox fan i do love our “Green Monster” but this is awsome!